This week sixth graders tried out an app called Write About This. 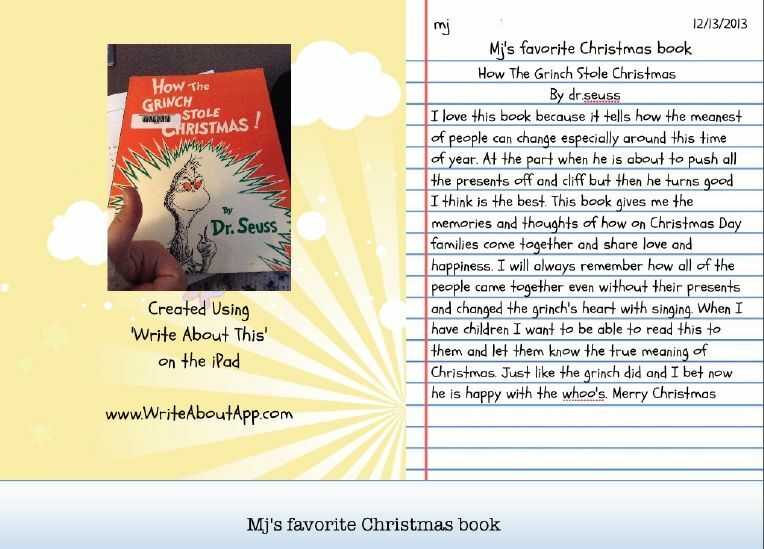 They each chose their favorite Christmas book and took a picture of the cover, made it into a custom writing prompt, and described why the book was among their favorites. After they finished they emailed their work to me. This is a great app for writing….easy to use, fun, and filled with lots of great features. In addition to using the custom prompt option, student could also pick from three levels of other prompts. The prompts feature a stunning photograph and an interesting idea for their writing. This would be a great app for classroom teachers as well. I plan to have students use this for reflective writing when it’s their turn on our iPad minis. It could also be used for book reports for our Book Clubs that will start after Winter Break. There is both a free version and a paid version available on the App Store. This one’s a winner! Kindergarten–Kindergarteners love Pete the Cat! This week they heard Pete the Cat Saves Christmas by Eric Litwin. Poor Santa has caught a chill and it’s up to Pete to deliver the gifts. We went online to watch the YouTube video of the song in the story as well. First Grade–For first grade this week, I tried out the site We Give Books. You can find it at wegivebooks.org (sorry, the link maker isn’t working on WordPress this week) and projected the story from my laptop to our TV. We Give Books has ebooks from dozens of publishers and it a lovely, low key way to use an ebook. According to the site, “All of the books available for online reading are children’s picture books appropriate for children through age ten. There is a mix of fiction and nonfiction, a range of authors, and an equal balance between read-alouds and books for independent readers. We’ll be adding news books every month, together with special seasonal offerings.” These aren’t book apps, so their is no interactivity which is actually very nice. The pages “turn” in the book and there is a full screen option so they project beautifully. First graders saw A Night In Santa’s Big Bag, the story of a stowaway toy on Christmas Eve and they were delighted with it. Second Grade–Second Graders watched a book app called An Elf for Christmas by Michael Garland. This is a lovely app with wonderful illustrations and tells the story of an elf who gets delivered with a toy airplane and has to find his way back to the North Pole. We started out with a thinking routine called Every Picture Tells A Story and after looking at a screen shot from the app, they predicted what might happen in the story. This is one app I’ve found works better with me reading the text. The highlighted text and the rather strange voice of the narrator were distracting but the story and the illustrations nicely compensate. This is an app worth getting for the holidays. Third Grade--Auntie Claus by Elise Primavera is one of our all time favorite holiday stories. The story of Santa’s sister and her niece has excitement, fantastic illustrations, and a lovely theme. Fourth Grade–Fourth graders heard The Trees and the Dancing Goats by Patricia Polocco this week. This is one of Ms. Polocco’s wonderful stories about her childhood in Michigan. It is a great way to compare different holiday traditions and promote the understanding of the importance of giving. Fourth graders did the Visible Thinking Routine called Every Picture tells a Story before they heard the book and studied one of the illustrations from the story. After noticing the details they were able to predict the story’s setting and time and came up with some interesting ideas about the plot. Fifth Grade–Fifth Graders used the iPad for a Holiday Internet Scavenger Hunt this week and enjoyed both using the iPad and finding quirky holiday facts. This will be my last post for the year. Happy Holidays to you all! See you in 2014! This entry was posted in Uncategorized and tagged Christmas, Patricia Polocco, Pete the Cat, reflective writing.